Everyone loves to eat fruits. Each fruit has its own characteristic fragrance and taste. Each of the kind contains different vital nutrients. In other words, fruits can be called the 'Packet of Nutrients'. Everyone irrespective of age limits enjoys the taste of food. But today, we are not getting healthy fruit. Most of the fruits sold in markets are artificially ripened using chemicals. These chemically grown fruits spoil our health instead of improving our health. Why can't we grow some fruits in a healthy way without any chemicals? Yes, we can. Here are some of the fruits plants that can be easily grown at home. b. Germination time: 7 to 10 days. c. The temperature required: 20°C. d. Harvest time: 65 to 90 days from germination. Watermelon is one of the common fruit that is available everyday. There is nobody who has not tasted this yummy fruit. This fruit is most seen during summer as it has a great hydrating ability. It can be directly eaten or can be crushed into juice and consumed. Watermelon helps prevent both low potassium and magnesium deficiency, and these are two critical nutrients used to help remedy high blood pressure naturally. Consuming proper amounts of potassium and magnesium from a healthy diet is correlated with overall reducing the risk for cardiovascular diseases. Watermelons can be easily grown at home using seeds. Sow the seeds about 2 inches deep in the soil. The seeds take about 7 to 10 days to germinate. Watermelons are the warm-weather crop. So it can sustain heavy sunlight. It requires direct sunlight so it is better to grow in outdoor or place it where it can get the sunlight properly In case you are planting the Watermelon indoor that will grow less abundantly due to less sunlight. So it is better to grow it outdoors for the best result. Watermelon needs 20°c to 25°c temperature to grow. At this temperature, it can grow well. Use a well-drained good potting mix to grow the plants. It is better to use organic fertilizers instead of chemical one. The chemical fertilizers spoil the fertility of the soil. As it is a summer crop, Watermelon does not require more water. In summer, water once in 2 days and 3 days once in the winter and rainy season. Bacterial Fruit Blotch, Anthracnose, Downy Mildew, Alternaria Leaf Spot, Cercospora Leaf Spot are the common diseases. If your plants are facing these problems, we advise using the "Neem oil". Watermelon plant will take 65-90 days to harvest from the sow. When a melon is ripe, it turns to creamy yellow from near white. Cut the Watermelon from the knife or in the pruning secateurs safely. No need to remove the plants it will re-grow. c. The temperature required: 20°C to 25°C. d. Harvest time: nearly 7 to 9 months from germination. The orange colored melon-like fruit is native to southern Mexico and Central America but can be grown in most tropical areas. Ripe papaya is commonly used around the world to make juice or as a delicious addition to salads or desserts. Papaya is also commonly used as a digestive enzyme to improve digestion. Papaya contains a special digestive enzyme called papain, which makes it a powerful digestive enzyme. It can also help the body to heal wounds, to reduce inflammation, to purify the blood etc., It also has the ability to cure kidney stone problem. Papayas can be grown from seeds at home. Summer season is the best season to grow Papaya plants. In the summer season, Papaya starts to grow soon. Papayas are warm weather crops. So require the temperature between 20°c to 25°c to grow quickly. Papaya will take 15 to 20 days to germinate. During the germination period, the soil must be moist. Papaya does not require more water. Three days once in winter and rainy season, two days once in the summer season would be enough. Overwatering can invite the diseases. It can grow with less sunlight. But it needs at least two to three hours of sunlight. Provide good potting mix that is rich in nutrients so that the plants grow healthy. The soil must be well drained such that the excess water can flow through. Bacterial leaf spot, Anthracnose, Phytophthora fruit and stem rot are the common diseases found in papaya plants. Use organic pesticides like Neem oil to cure the plants. Avoid chemical fertilizers so that you get chemical free and organic yield. Papaya will take seven to eight months to harvest from the seeding. 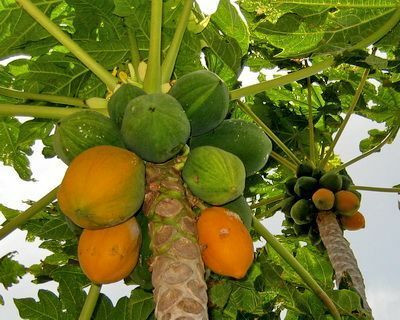 Papaya fruit should be harvested when some yellow shows on the fruit, but before turning fully yellow. You can pluck the Papaya directly from hand. But handle the plant gently while doing so. You can also cut the Papaya from pruning secateurs safely, it will re-grow. c. The temperature required: minimum of 20°C. d. Harvest time: nearly 70 to 100 days from germination. Muskmelon is one variety of melon that is commonly found everywhere. It can be either eaten or crushed into juice. It has a very unique taste that makes everyone to consume it more often. Muskmelon is a high fiber fruit, with an abundance of vitamins A and C, and potassium. This makes muskmelon a nutrient-dense food, meaning its nutritional benefits outweigh its calorie content. Muskmelon is a summer crop. Muskmelon will grow quickly in the summer season. During the hot weather, Melon’s germination process will be strong. During the germination period, soil should be moist and water will be most important. If we are providing water on the time it will take 10 days to germinate. 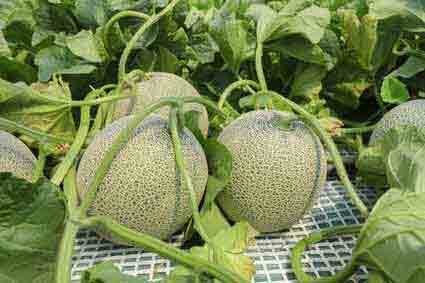 Muskmelon needs 15°c to 21°c of temperature to grow quickly. In this temperature, Muskmelon grows well. They are basically outdoor plants, but we can grow it indoor also. In case you are planning to grow indoor, place it where it can get at least three to four hours sunlight everyday. They require more water. So it needs regular water in summer, two days once in winter and rainy season. Well-drained potting mix helps the plant to grow well and absorb sufficient moisture. A potting mix containing cocopeat helps in retaining moisture content for a quite long period as Muskmelons might lack water content. Use organic fertilizers and plant foods to provide essential nutrients to the plants. Do not use any chemical fertilizers. Instead, you can prepare organic compost at home with the food residues using compost bin. Aphids and cucumber beetles can affect melons. "Neem oil" is a natural pesticide. So it avoids the diseases. Muck melon will take 70 to 100 to harvest from the seeding. When melons reach full size and stem turn brown, they are ready for harvest. Cut the melons off the plant by hedge shear safely. No need to remove the plants because It will re-grow.